40 True and False statements about all aspects of India – history, popular culture, achievements in science and math, Indian animals, important historical people and more! 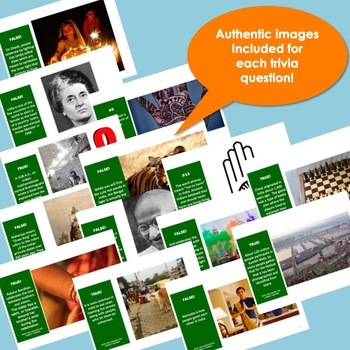 PowerPoint slides with authentic images for each statement bring the lesson to life. Snakes and Ladders, an Indian Trivia Game combines the "True or False" game with the game of Snakes and Ladders. Students are asked a question about India. By answering the Indian trivia questions correctly, students can move their tokens around the game board and be helped or hindered by landing on a ladder or a snake. The lesson includes easy-to-follow game set up and instructions. Learning about global customs can foster an appreciation for cultural diversity. 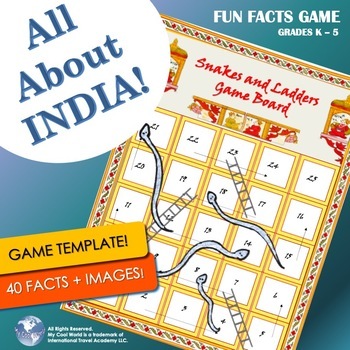 Snakes and Ladders, an Indian Trivia Game is a fun and easy complement to India studies for any age. PowerPoint images are included with the lesson. Snakes and Ladders is an EASY PREP activity. Prep involves copying included templates onto card stock or copy paper. The Snakes and Ladders game board template is available in color (suggested) or black and white versions. 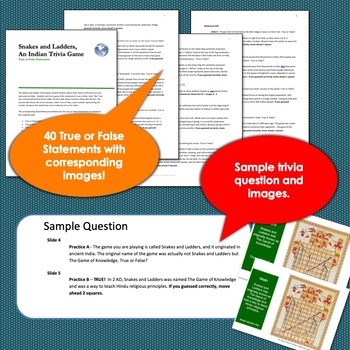 Materials needed include are Snakes and Ladders Game Board template printed onto white card stock, in color or black and white, True Card template copied onto red card stock, False Card template copied onto yellow card stock, Ashoka Chakra Game Token template copied onto white card stock, and True or False Statement Sheets copied onto white copy paper for teacher’s use during the game. A copy may also be given to each student to distribute after the game to take home (optional). YOU CAN FIND MORE LESSONS ON INDIA HERE: My Cool World India! "In my nearly 30-year career in education, I have never seen children so engaged in their learning! International Travel Academy is truly a multi-disciplinary approach that enables children to explore the world in an unforgettable way. Students get a real sense of what it means to respect another country's heritage, beliefs and ways of living, thus making them more tolerant and internationally-minded. I highly recommend this program to educators and parents wishing to make learning come to life!" Our lessons have been tried and tested for the past seven years. But, as we are new to TPT, we would love to get feedback from you! Please email us! Our personal emails are included in the lesson. Please go to your My Purchases page (you may need to login). Beside each purchase you'll see a Provide Feedback button. Simply click it and you will be taken to a page where you can give a quick rating and leave a short comment for the product. Each time you give feedback, TPT gives you feedback credits that you use to lower the cost of your future purchases. I value your feedback greatly as it helps me determine which products are most valuable for your classroom so I can create more for you. This product is for personal classroom use by a single teacher. 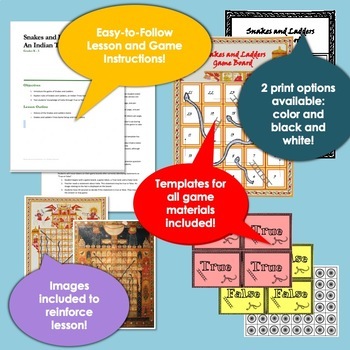 If you would like to copy this product for more than one teacher, please download additional licenses, available at 10% off the original price! You cannot give this item to others, copy this item for use by others, post this item on a website, or copy or modify any part of this document to offer others for free or for sale. Please feel free to use as needed for your personal use, for your classroom, or to copy for your students. Of course, you may always purchase unlimited licenses for others to use at 10% off the original price.